It would have been a bit unwieldy to herd the more than 4,500 people in attendance outside to the nearest vine, the one growing around the Grand Canyon University Arena sign on Camelback Road. So the executive pastor of Central Christian Church of the East Valley settled for a different prop. “Jesus had a vine, I have an orange tree, OK? We’re going to go with that,” he said. He then proceeded to educate and amuse the crowd with his thoughts about one of the most quoted Bible passages. 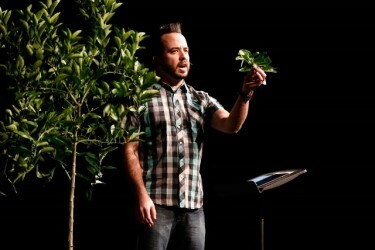 First, he pruned a branch to demonstrate a good relationship with God. “The healthy branch gets pruned,” he said. In other words, we constantly need to “prune” our lives to keep our branch healthy and able to bear fruit. More telling, though, was his message when he cut off a lower branch. We sometimes do this to ourselves, he pointed out, by distancing ourselves from God, but, worse yet, we sometimes do it to each other — including some Christians who think it’s up to them to make those decisions. “If you look at Christianity today, you’re going to see a lot of Christians who say, ‘So-and-so has been cut off from the vine, so-and-so is on their own, they are cut off from the vine,’” he said. “And yet that’s not our job. That’s the gardener’s job. Some people try to show their “fruit” but actually live a life that does not make that fruit blossom, which led Jernigan to his main point. Producing a roll of duct tape, he took a banana and affixed it to one of the branches, which barely supported the banana’s weight. Jernigan’s other analogy was of a fighter jet getting refueled by an air tanker, which he demonstrated by harkening back to his days of trying to do that in a video game. It works only if they fly at the exact same speed, just as we need to stay in alignment with God’s will. ● For a replay of Jernigan’s talk, click here. 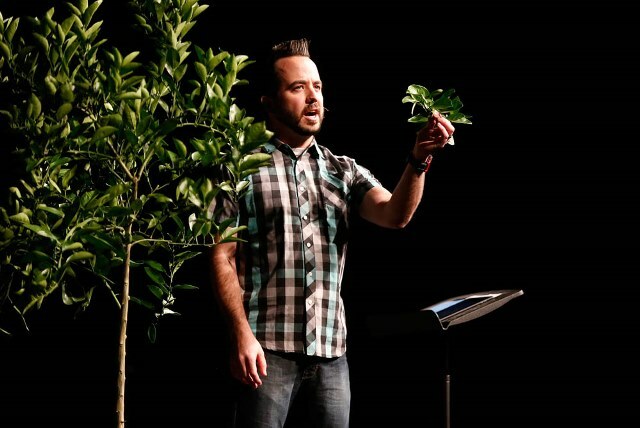 ● Next week’s Chapel speaker: Tyler Johnson of Redemption Church.